TRITON was a fish-tailed sea-god, the son and herald of Poseidon who stilled the waves with his conch-shell trumpet. 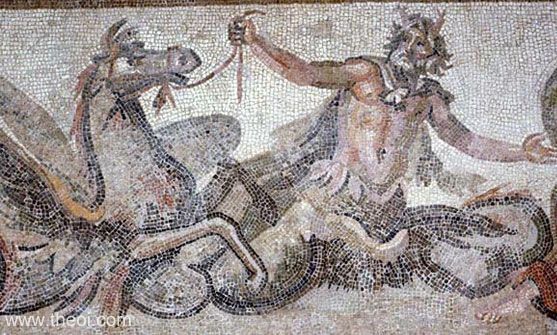 Triton was also described as the god of the Tritonis, a large salt-lake in Libya. When the Argonauts found themselves stranded in the middle of the desert he helped them find passage from the lake back to the sea. 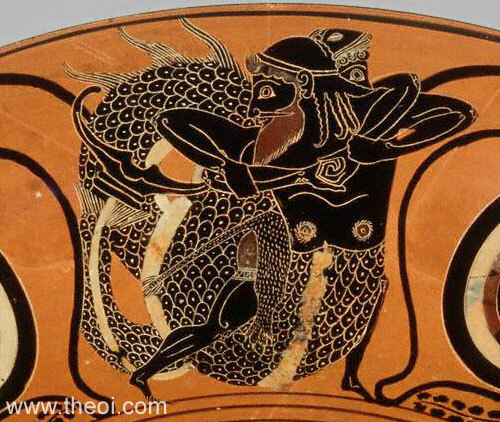 Trtion was depicted in Greek vase painting as fish-tailed merman, sometimes bearded, sometimes youthful. In Greek sculpture and mosaic he was often given a double-fish or dolphin tail. Mosaic art also added a pair of crab-claw "horns", green-tinged skin, and occasionally a pair of equine forelegs. 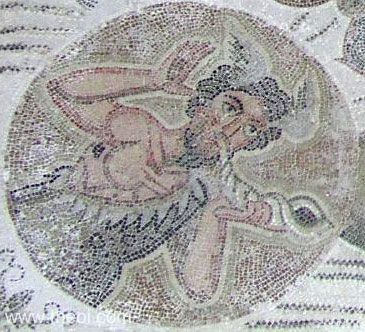 As Poseidon's herald he had a winged brow and conch-shell trumpet. 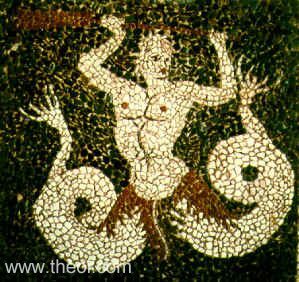 Triton was often multiplied into a host of sea-spirits called Tritones which were regarded as satyr-like daimones (spirits) of the sea. "When it came time for the birth, Prometheus . . . by the river Triton struck the head of Zeus with an axe, and from his crown Athene (Athena) sprang up." "They say that after Athene's birth, she was reared by Triton, who had a daughter named Pallas." "Ares mated with Triteia the daughter of Triton, that this maiden was priestess to Athena, and that Melanippos (Melanippus), the son of Ares and Triteia, founded the city [of Triteia in Akhaia (Achaea)]." "The [Nereid] nymphe sports on the peaceful sea, driving a team of four dolphins yoked together and working in harmony; and maiden-daughters of Triton, [the Nereid] Galateia's servants, guide them." "There is a story similar to this about the shell of Triton. He, too, when he had hollowed out the trumpet he had invented, took it with him against the Gigantes (Giants), and there blew strange sounds through the shell. The Gigantes, fearing that some wild beast had been brought by their adversaries, took to flight, and thus were overcome and came into their enemies' power." "[After the Great Deluge had wiped out mankind :] The Lord of the Sea (Rector Pelagi) [Poseidon] laid by his three-pronged spear and calmed the waves and, calling from the deep Triton, sea-hued, his shoulders barnacled with sea-shells, bade him blow his echoing conch to bid the rivers, waves and floods retire. He raised his horn, his hollow spiralled whorl, the horn that, sounded in mid ocean, fills the shores of dawn and sunset round the world; and when it touched the god's wet-bearded lips and took his breath and sounded the retreat, all the wide waters of the land and sea heard it, and all, hearing its voice, obeyed." "In the waves the Sea-gods (Di Caerulei) dwelt, Aegeon, his huge arms entwined around the backs of giant whales, ambiguous Proteus, Triton with his horn." "She gazed in wonder at his [the sea-god Glaukos' (Glaucus')] colour and his hair that clothed his shoulders and streamed down his back, and thighs that formed a twisting fish's tail . . . [and] he said, ‘. . . I am a Sea-God (Deus Aquae). Over the open sea not Proteus, no, nor Triton nor Palaemon Athamantiades has greater power than I.’"
"A sea tossed by the winds, on which you are none the less making ready to sail, despite the threatening floods . . . Look you, how Eurus (the East Wind) tosses the rolling waters! . . . Soon the winds will fall, and o'er the smooth-spread waves will Triton course with cerulean steeds." "His ship was the giant Triton, the sound of whose conch affrighted the dark-blue water; its dipping figurehead the hairy trunk of a man to the waist, bellow the belly a great fish." "The sound of water which splashes all round he basin, when the Triton suddenly pours forth a fountain from his lips." "[Octavian defeats Marc Antony at the historical battle of Actium :] Triton hails the outcome on his conch, and about the standard of liberty all the goddesses of the sea [i.e. the Nereides] clapped their hands." "The merman Triton who is depicted riding upon swimming monsters attached to his man's body." "[Cicero quoting Accius' Medea :] Triton's trident, heaving up the roots of cavernous vaults beneath the billowy sea, hurled from the depths heaven-high a massy crag." "No more winningly does . . . Triton rise higher [than waist deep] from the summer waves." "The winged Arcadian [Hermes] is the messenger of supreme Jove [Zeus]; Juno [Hera] hath power over the rain-bringing Thaumantian [Iris the rainbow]; Triton, swift to obey, stands ready at Neptunus' [Poseidon's] bidding." "Then let Proteus of manifold shape and twy-formed Triton swim [protectively] before [the ship], and Glaucus." 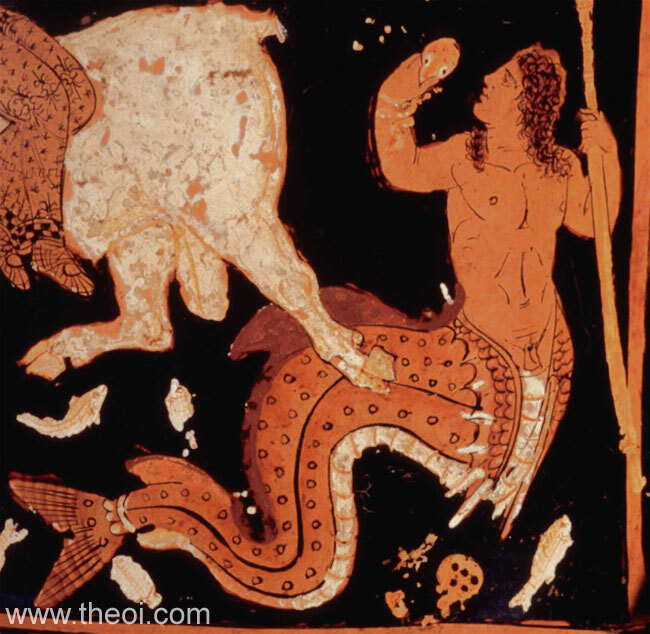 "[When Zeus abducted Europa in the form of a bull and carried her across the sea :] Triton heard the delusive lowing of Zeus, and bellowed an echoing note to Kronides (Cronides) [Zeus] with his conch by way of wedding song." "[When the gods took sides in the battle of Dionysos against the Indians, Poseidon and Apollon faced off against each another :] The stormy trumpet of the sea brayed in the ears of Phoibos (Phoebus) [Apollon]--a broadbeard Triton boomed with his own proper conch, like a man half-finished, from the loins down a greeny fish--the Nereides shouted the battlecry--Arabian Nereus pushed up out of the sea and bellowed shaking his trident." "[When Poseidon led the sea-gods into battle against Dionysos and his allies during the Indian War :] The broadbearded Triton sounded his note for the mad battle--he has limbs of two kinds, a human shape and a different body, green, from loins to head, half of him, but hanging from his trailing wet loins a curving fishtail, forked." 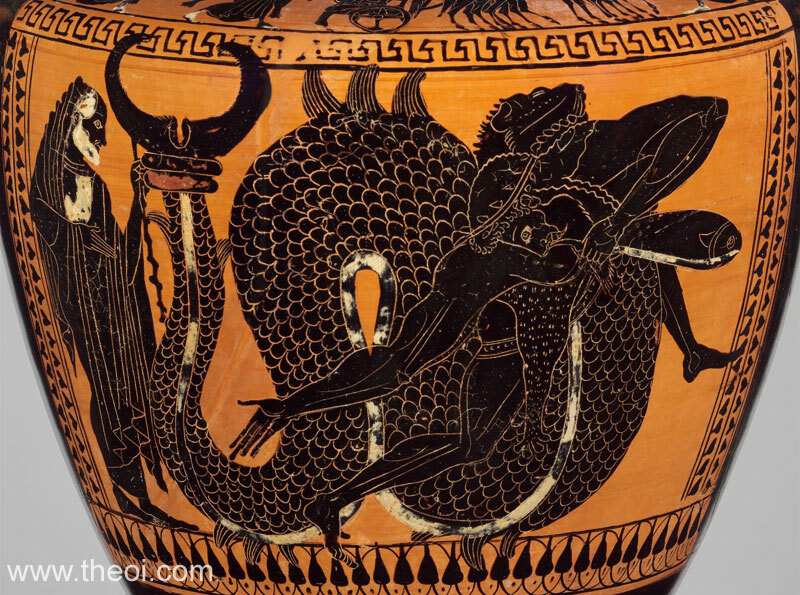 Herakles is depicted wrestling Triton in early Athenian vase painting (see images on this page). The story is probably a variation of the tale in which the hero captures Nereus, the old man of the sea, to learn the location of the golden apples of the Hesperides -- the elderly deity being replaced by his vigorous, young grandson as the wrestler. "[The] Nymphai (Nymphs) who were daughters of Zeus and Themis . 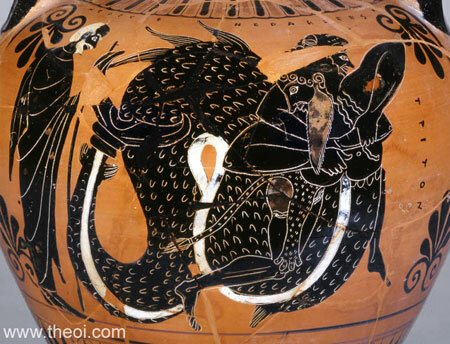 . . showed him [Herakles (Heracles)] Nereus. Herakles took hold of him as he lay sleeping, and bound him fast as Nereus changed himself into all sorts of shapes; he did not let him loose until Nereus told him where the apples and the Hesperides were." "[The Argonauts were porting their ship across the Libyan desert in the vicinity of Lake Tritonis, when they encountered Triton :] A sign there was to tell that Thera shall prove the mother of great cities, when leaping from the prow where Lake Tritonis pours to the sea, Euphemos (Euphemus) took the gift, token of a host's friendship, from a god [Triton] in mortal guise ho gave a clod of earth; and from aloft, to mark the sign, a peal of thunder sounded from Zeus the father, son of Kronos (Cronus). This so befell, as on our ship we hung the bronze-fluked anchor . . . when for twelve days we had carried from Okeanos (Oceanus) over earth's desert backs our good ship's hull . . .
Then came to us this deity, all alone, clad in the noble semblance of a man of reverent bearing, and with friendly speech made to address us with a kindly greeting--such words with which a man of good intent speaks to invite the strangers newly come to share his table, and bids them first welcome. Yet did the dear plea of our homeward voyage call to us and forbade our stay. His name he gave, Eurypylos (Eurypylus), saying he was the son of the immortal Holder of Earth, Ennosides [Poseidon]; He saw hour haste to be away, and straightway he stopped and seized a clod beside his foot and in his right hand proffered the gift of friendship. And, for he felt no misbelief, Euphemos lept to the shore and grasped his outstretched hand, and took the earth, that sign of heaven's will. But now I learn that it is lost, washed down as evening fell from the ship's deck, to wander on the sea's dark smooth tide, with the sea spray. Many a time, indeed, did I charge to the serving-men who ease our toil to watch it well; but they forgot. Thus now the deathless seed of Libya's far-spreading plains is spilt upon this isle, e'er the due time. For had that prince, son of the horseman's god Poseidon . . .
"The following story is also told : it is said that Jason, when the Argo had been built at the foot of Pelion, put aboard besides a hecatomb a bronze tripod, and set out to sail around the Peloponnese, to go to Delphoi (Delphi). But when he was off Malea, a north wind caught and carried him away to Libya; and before he saw land, he came into the shallows of the Tritonian lake. There, while he could find no way out yet, Triton (the story goes) appeared to him and told Jason to give him the tripod, promising to show the sailors the channel and send them on their way unharmed. Jason did, and Triton then showed them the channel out of the shallows and set the tripod in his own temple; but first he prophesied over it, declaring the whole matter to Jason's comrades: namely, that should any descendant of the Argo's crew take away the tripod, then a hundred Greek cities would be founded on the shores of the Tritonian lake. Hearing this (it is said) the Libyan people of the country hid the tripod." As he prayed he slit the victim's throat and threw it into the water from the stern. Whereupon the god emerged from the depths, no longer in disguise but in his own true form, and grasping the stem of their hollow ship drew her on towards the open sea. So does a man trot along beside a fast horse griping his bushy mane, as he brings him in to race in the great arena; and nothing loath, the horse goes with him, tossing up his head in pride and making the foam-flecked bit ring out as he champs it in his jaws to this side and that. The body of the god, front and back, from the crown of his head to his waist and belly, was exactly like that of the other immortals; but from the hips down he was a monster of the deep, with two long tails, each ending in a pair of curved flukes shaped like the crescent moon. With the spins of these two tails he lashed the surface of the water, and so brought Argo to the open sea, where he launched her on her way. Then he sank into the abyss, and the Argonauts cried out in wonder at the awe-inspiring sight. They spent that day on shore. The harbour there bears Argo's name and there are signs of her stay, including altars to Poseidon and Triton. At dawn they spread the sail and ran before the west wind, always keeping the desert on their right." Euphemos heard Iason's prophecy with joy and did not make it void. He threw the clod into the depths of the sea, and there grew up from it an island called Kalliste (Calliste), the sacred Nurse of his descendants." "[In Libya] where to Triton, descendant of Nereus [his mother was Nereus' daughter Amphitrite], the Kolkhian (Colchian) woman [Medea] gave as a gift the broad mixing-bowl wrought of gold, for that he showed them the navigable path [from Lake Tritonis in Libya across the desert to the sea] whereby Tiphys should guide through the narrow reefs his ship undamaged. And the twy-formed god, son of the sea, declares that the Greeks shall obtain the sovereignty of the land [Libya] when the pastoral people of Libya shall take from their fatherland and give to a Hellen the home-returning gift." "When they [the Argonauts] were driven by winds to the Syrtes and had learned from Triton, who was king of Libya at that time, of the peculiar nature of the sea there, upon escaping safe out of the peril they presented him with the bronze tripod which was inscribed with ancient characters and stood until rather recent times among the people of Euhesperis [near Kyrene (Cyrene) in North Africa]." "The Vessel [Argo] . . . pitches to and fro, with the Triton on its bow now projecting from the water's depths, now borne aloft in air." "High on his chariot comes the ruler of the deep [Poseidon], and twy-formed Triton swimming by the foaming bridles gives signal far and wide to the subsiding main; Thetis is smooth again, and hills and shores emerge." Greek Sparta Floor Mosaic C2nd B.C. Greco-Roman Piazza Amerina Mosaic C4th A.D.
Greco-Roman Volubilis Floor Mosaic A.D.
Greco-Roman Chebba Floor Mosaic C2nd A.D.
Greco-Roman Ostia Floor Mosaic A.D.
Other references not currently quoted here: Claudian 28.378, Orphic Argonautica 337, Tzetzes on Lycophron 34 & 75.